In this exhibition, the Getty Research Institute presents highlights from the an extraordinary collection of illustrated manuscripts. Displayed together publicly for the first time, these manuscripts on the history of science and ideas demonstrate the circulation of knowledge around the world and across cultures during the medieval and early modern periods. Medieval Muslim and Christian medicine, Chinese acupuncture, secret experiments in alchemical laboratories, codebooks for keeping secrets secret, and French and Persian visions of the cosmos that blend science with spirituality are among the treasures on display. These manuscripts were produced for caliphs, popes, merchants, and scientists. Copied and illustrated by hand, their contents—their ideas and visions—illustrate the human urge for knowledge and creative invention. Here are two samples from the exhibit that touch upon Muslim art. 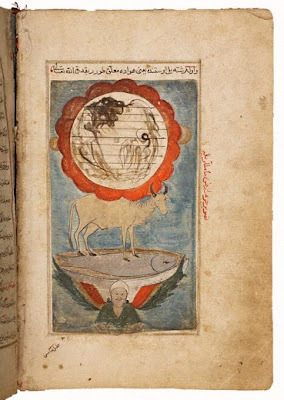 The sensationalist, illustrated narrative in the book above, at left, traces the creation and evolution of celestial and terrestrial life; it quickly became one of the most popular scientific digests in the Islamic world. Zakariya ibn Muammad al-Qazwini's Creatures and Phenomena Marvelous and Strange has at its core a moralizing standpoint that glorifies the wondrous nature of God's creativity and its structured order. Medieval physicians debated theories of how the human body could be influenced, adjusted, and repaired by external physical factors, including forces exerted by the planets and stars, and the herbs and minerals found on Earth. Celestial medicine, which charted the effects of the heavenly bodies on the activity of the human body, identified opportune moments in astral cycles for medical procedures. Herbal remedies were offered in manuscripts with illustrated instructions on the identification of plants and the medical effects on the human body that could be distilled from their essences. 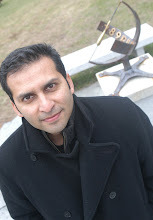 Meanwhile, advancements in the study of anatomy throughout Europe and Asia allowed physicians to repair the human body through techniques such as surgery and acupuncture. 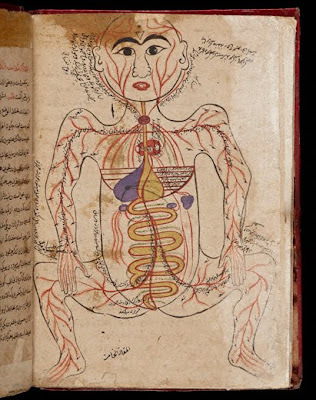 One of the earliest known illustrations of human anatomy in the Islamic world appears in this standard "desk reference," above, for Arabic and Persian physicians. The color-coding of veins and arteries as blue and red is preserved in today's culture by the spiraling blue, red, and white stripes of a barber's pole, harking back to the days of the barber-surgeon in the Middle Ages.